Climate change the main cause for cold weather in Europe? The exceptionally cold weather characterized by chilling winds and temperatures well below zero degrees Celsius has been striking Europe for more than a week. According to a scientist Alfred Wegener from the Institute for Polar and Marine Research the main cause for this exceptionally cold weather is climate change, or to be more precise the huge loss of Arctic ice. First, less ice means less solar heat is reflected back into the atmosphere. Rather, it is absorbed into the darker ocean waters. Second, once that heat is in the ocean, the reduced ice cap allows the heat to more easily escape into the air just above the ocean’s surface. Because warmer air tends to rise, the moisture-laden air near the ocean’s surface rises, creating instability in the atmosphere and changing air-pressure patterns, the scientists say. A project to build a pioneering science centre with more than six miles of walkways will give tourists spectacular views in the heart of the Amazon rainforest. The £6.4m centre will be built by a British charity and will act as a research base for scientists from the Royal Botanic Gardens, provide jobs for Brazilian tribes and attract eco-tourists, according to The Sunday Times. Tourist high-light: The walkway will give visitors a stunning view of the rainforest from high above the jungle floor. The ambitious walkway will be located in Roraima, a remote province of northeast Brazil, and will be designed by the same architects who created the London Eye and Kew Gardens’ treetop walkway. Researchers will use the walkway to study the rainforest canopy while tourists will be able to enjoy stunning views from high above the jungle floor. Roraima is the northernmost and least populated state of Brazil. It borders Venezuela and Guyana and renowned for its challenging hiking routes. Dramatic and unprecedented plumes of methane – a greenhouse gas 20 times more potent than carbon dioxide – have been seen bubbling to the surface of the Arctic Ocean by scientists undertaking an extensive survey of the region. The scale and volume of the methane release has astonished the head of the Russian research team who has been surveying the seabed of the East Siberian Arctic Shelf off northern Russia for nearly 20 years. Earlier they had found torch-like structures like this but they were only tens of metres in diameter. This was the first time that they had found continuous, powerful structures, more than 1,000 metres in diameter. Over a relatively small area they found more than 100. 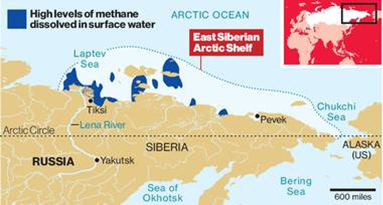 Scientists estimate that there are hundreds of millions of tonnes of methane gas locked away beneath the Arctic permafrost, which extends from the mainland into the seabed of the relatively shallow sea of the East Siberian Arctic Shelf. One of the greatest fears is that with the disappearance of the Arctic sea-ice in summer, and rapidly rising temperatures across the entire region, which are already melting the Siberian permafrost, the trapped methane could be suddenly released into the atmosphere leading to rapid and severe climate change. Mexico will earn a royalty on carbon credits generated from energy-saving light bulbs through a world-first deal that could pave the way for other developing countries to fund emissions cuts. Under the project, an Australian company, Cool nrg International will distribute 45 million energy efficient light bulbs to 6.5 million low-income households in Mexico City. The aim is to generate energy savings of 33,000 gigawatt hours, cutting annual emissions by the equivalent of about one-third of car emissions in a city renowned for its smog. In total, the project aims to reduce 16 million tonnes of carbon dioxide (CO2), the main greenhouse gas, over 10 years. Every tonne of CO2 saved will generate a credit, or certified emission reduction (CER), which will be sold to companies in rich nations, which will incur huge fines if they overstep their limits and do not buy in carbon credits to cover any shortfall. The project is seen as a possible model for other developing countries looking for ways to fund the promotion of energy saving and less-polluting technologies. While complex to carry out and monitor, the Mexican project could result in significant emissions cuts, help low-income households save money on energy and generate funds for the government too as they receive commission from light bulb company. A light-bulb project by Cool nrg and its partners in 2009 was the first of its type to be approved under an expanded form of the United Nations’ Clean Development Mechanism. The CDM allows clean energy project developers to earn CERs from projects in poorer countries. The present: As a major user of freshwater and fossil fuels, a significant producer of greenhouse gases and a frequent trigger to deforestation, agriculture has tended to be seen as part of the climate change problem rather than an agent of mitigation. The concept of Climate Smart Agriculture (CSA) seeks to reverse that pattern. Developed countries currently focus on reducing energy inputs and emissions, and look for suitable opportunities for biofuel production. They look at opportunities for carbon trading from agricultural production, while the least developed countries are likely to be predominantly focussed on adapting their agricultural systems to meet the challenges posed by a changing climate. How is this for a neat idea?